At Boise Cat Clinic we understand and honor the unique and meaningful bond between cats and their human families. From kittenhood through the senior years, we provide individualized care recommendations to promote a healthy, happy, and comfortable lifestyle. 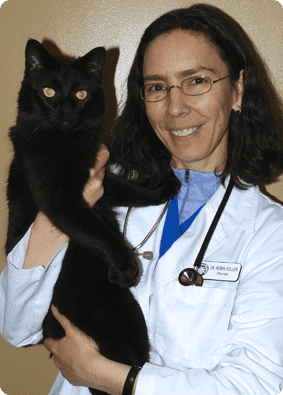 Originally from Bay City, Michigan, Dr. Roller earned her Doctor of Veterinary Medicine from the University of Wisconsin-Madison in 2004. 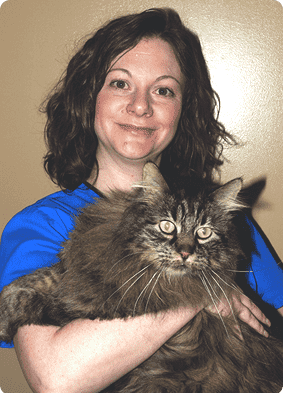 Dr. Roller’s career has been devoted to practicing feline exclusive medicine. She’s always had clear vision of creating her own practice and in 2011, she and her Hospital Administrator Haylee opened Boise Cat Clinic. Dr. Roller enjoys being part of Boise’s independently owned business community. Dr. Roller shared her life for over 18 years with two very special cats, Ross and Simon. It is this special bond that inspires her to provide high quality medicine and care for cats. She truly understands and honors the emotional relationships we form with our cats, and enjoys helping them live longer, healthier, more comfortable lives. Prior to working in the veterinary field, Dr. Roller earned a BFA in Photography from Alma College (Alma, MI) and spent some time in both Michigan and Chicago working as a professional photographer. These days her talents are put to good use taking photos of patients at the clinic! Dr. Roller enjoys spending time with her favorite feline Noodle, and also enjoys swimming, hiking, reading, and traveling. Dr. Roller belongs to the following professional associations: American Veterinary Medical Association, American Association of Feline Practitioners, The Veterinary Information Network, and Idaho Veterinary Medical Association. 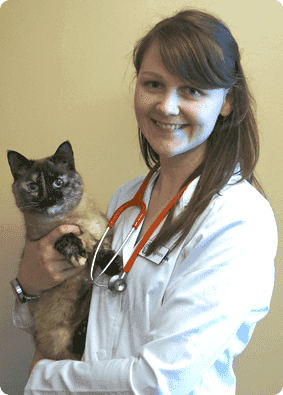 An Idaho native, Dr. Irwin returned to the gem state after studying veterinary medicine at Colorado State University where she completed the exclusive MBA/DVM combined degree program and held a leadership role in her local chapter of the American Association of Feline Practitioners. Dr. Irwin’s adoration of kitties began at the age of the three with her first cat, Candy – so named because ‘I love cats, and I love candy.’ As her appreciation for the special intricacies of the human-feline bond grew, her pursuit of a career in feline-exclusive medicine was only natural. 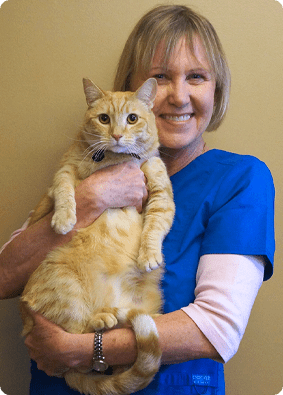 Dr. Irwin believes that this special bond is best served through compassionate care for kitties and sharing her knowledge with the people they have touched. Dr. Irwin’s professional interests including nutrition, behavior, and medicine. Outside the clinic, she enjoys spending her free time hiking, biking, and kayaking, as well as curled up knitting with her three kitties: Stella, Twila, and Norabel. Dr. Irwin is proud to belong to the following professional associations: American Veterinary Medical Association, American Association of Feline Practitioners, Idaho Veterinary Medical Association, and the American Animal Hospital Association. 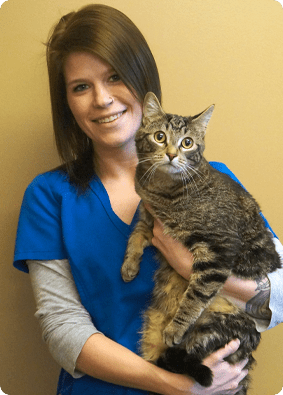 Haylee, our Hospital Administrator, is a Boise native and has been working with cats in a clinical setting for over 12 years. In 2018 she earned her CVPM credentials–Certified Veterinary Practice Manager. Her background includes serving on the Board of Directors of a local animal welfare organization. She facilitated fostering & adoption programs, and helped to develop marketing and fund-raising strategies. Haylee loves meeting each individual cat and their family, and works to ensure their visits are as stress free as possible. She also enjoys educating cat owners, with the goal of enriching the feline-human bond. 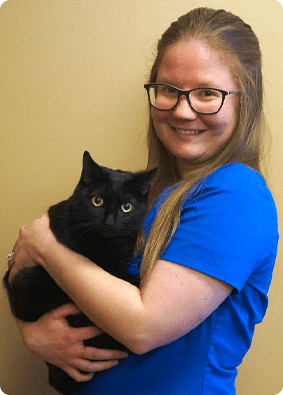 Haylee has dedicated her career to serving pets and their families, and knows firsthand the important roles cats play in our lives, as integral family members and loving companions. Katie graduated with honors from Brown Mackie College with a degree in Veterinary Technology. 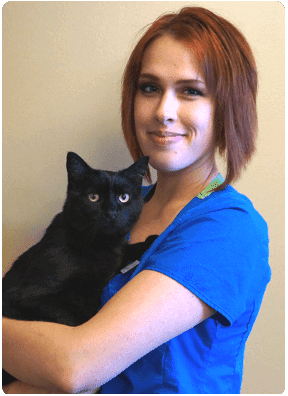 She joined the Boise Cat Clinic team directly out of school, and her professional background includes time spent in the pet grooming industry. As a self-professed “crazy cat lady,” she truly enjoys experiencing the human/animal bond between cats and their owners. Katie feels that cats are amazing and unique creatures, and loves the challenge of providing truly individualized care. Jessica graduated from Brigham Young University with a Bachelor’s degree in University Studies. With a background in customer service and hospitality, she worked at Disneyland and California Adventure Resorts, and is also an expert baker. Jessica grew up surrounded by animals and feels a deep love and respect for them. 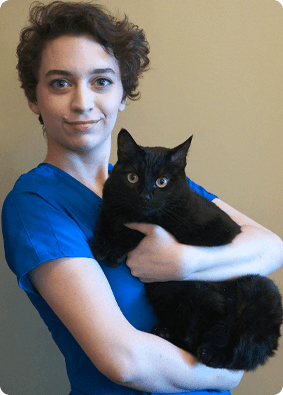 She feels that working in the veterinary industry is a challenging and rewarding experience, and a great way to give back to the animals who have enriched her life. She also finds it exciting that there is always something new to learn. Jessica’s dream is to retire to Territorio de Zaguates, the “Land of the Strays” in Costa Rica. Courtney’s professional background includes time spent working in Client Service positions and Management, as well as working at the Idaho Humane Society assisting members of the community. Since she was a young person, Courtney envisioned working with animals. Fostering kitties inspired her to seek the opportunity to specialize in feline only care. She loves working in veterinary medicine because no two days are alike and she finds it continually challenging. She also finds it very rewarding to work with people who share the same passion! Emma earned her Veterinary Assistant Certificate from Auburn University (OPCE). Prior to joining our team, Emma worked in a pet store as an Animal Care Specialist and Manager. She also has experience working in a grooming salon. 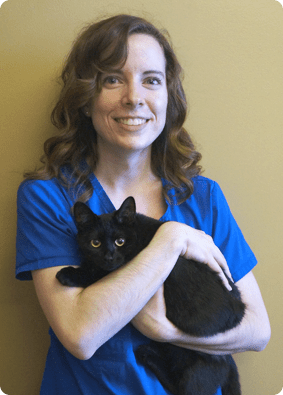 Emma enjoys the opportunity to provide kitties with the best treatment, and to ensure that their families feel reassured. Kate began her career with cats as the Head Caretaker and as Veterinary Assistant at a feline only hospital and hotel. Helping cats and their families has been her dream job since childhood, and she loves being surrounded by team members and cat families who have the same goal! Jeanette earned her Bachelor of Arts in Liberal Studies at California State University in Long Beach, California. Her background includes being a Professional Corporate Trainer and Instructional Designer in high-tech and financial services. Cats are her passion! She finds working with feline-focused veterinary professionals, pet parents, and their kitties to be very rewarding and fulfilling. Jeanette describes herself as both a cat person and a people person, and loves the opportunity to interact with both! Originally from Caldwell, Idaho, Noodle started his career as an abandoned farm cat. After his neuter, he attended Purrrdue College where he studied new processes for manipulating humans. Considered an expert in his field, he has published multiple papers on the topic (“How to Get the Treats You Want” and “Putty In Our Paws: Snuggling for Dummies”). 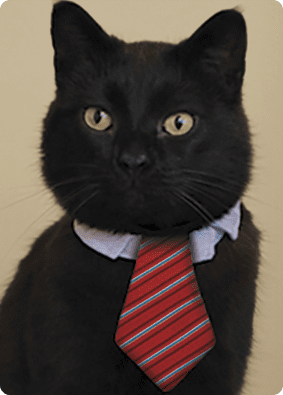 Since graduation and adoption, he has spent most of his free time developing ways to harness more sunlight and has published a new book: “Counter-Surfing 101.” As our Chief Feline Officer, he runs the people who run this company!